[May 16, 2013 — The Daily Barometer] — Oregon State University found out Wednesday night which chef’s cuisine reigned supreme. Chefs from the OSU campus competed for the title of Iron Chef:M cNary Champion in a setting similar to that of the hit TV show. University Housing and Dining Services held the event in collaboration with the Human Services Resource Center as a fundraiser for the OSU Emergency Food Pantry, which supplies food to students and community members in need. McNary Dining Hall, located on the east side of campus, hosted the event. Students and faculty members stopped and stared as each contestant used skill and finesse to create a masterpiece dish. Three chefs from across campus competed in the event with only the help of a single companion. Each team received 50 minutes to cook their meal, and then 10 minutes to plate their creations. Participating chefs had a box of secret ingredients commonly found in the OSU Emergency Food Pantry at their disposal. The chefs then used the ingredients to create a meal worthy of the title Iron Chef champion. Despite tough competition from the other chefs, Jason Phillips was able to use the skills he gained during his childhood to come out on top. Phillips grew up in Portland, and was inspired to cook by his grandmother. Phillips is currently a student in the OSU nutrition program, and spends his free time volunteering at the Jackson Street Youth Shelter teaching basic cooking skills to children. Those who would like to donate to the food pantry can do so by stopping by the Snell International Forum on Wednesday from 5 p.m. to 8 p.m. Additionally, donations are also accepted online through HSRC’s website. Read the full article by Lara von Linsowe-Wilson. Psi Chi, the Psychology Honor Society, is teaming up with ASOSU Veterans Affairs to host a viewing of The Invisible War, a documentary about Military Sexual Trauma and women in the military at 5:30 p.m. Feb. 20 in Gilfillan Auditorium. Gus Bedwell of Veterans Affairs will be our keynote speaker, and Julie of ASOSU Veterans Affairs will be hosting A Q&A session after the viewing. As the topic of sexual trauma can be triggering, please make note of the available resources on and off campus. For more information regarding The Invisible War, please visit the official movie site. Benny Beaver will be on hand as participants spin the wheel and win a variety of great and illuminating prizes aimed at making the commute safer for everyone. Bike lights, reflective gear and even some coveted illuminated umbrellas will be given away during the event. According to the Oregon Department of Transportation, every year in Oregon, the majority of pedestrian fatalities occur at night or in low-light hours. More than half of the pedestrians killed were wearing dark clothing and were not visible. In October 2012, ODOT reported that pedestrian fatalities in Oregon were up 23 percent from the same period the previous year. “We are very pleased that community interest in promoting safety and increased visibility among motorists, pedestrians, joggers and bicyclists is growing in the Corvallis community and on the Oregon State campus,” Clark said. “The last thing anyone wants is to have serious accidents or injuries occur. So we are simply promoting improved safety by being bright and being seen. The Be Bright! Be Seen public safety campaign is sponsored by Oregon State University, the city of Corvallis, the Corvallis Gazette-Times, the OSU Beaver Store and the OSU Daily Barometer. For more information, see http://poweredbyorange.com/be-bright. The web assistant works directly with University Housing & Dining Services’ online marketing specialist in order to update the UHDS website, create digital communications, and maintain social networks. The web assistant position is a student position in the Marketing, Assessment and Communications unit for UHDS. The MAC is a supportive creative team environment, where the web assistant will have the opportunity to participate in and contribute to multiple marketing projects for UHDS throughout the year. Typical hours: 10-15 per week through the end of spring term with possibility of extension. Pay: $10.38 per hour (Student Computer Operator 2 on OSU pay scale). For questions, please contact the online marketing specialist, Nancy Raskauskas. [The Daily Barometer, Oct. 17, 2012] — Halloween is two weeks away, and many students will don makeup and costumes in the spirit of the holiday. According to Community Relation Facilitators and members of cultural centers on campus, the choice of costume should be planned in a way that is considerate of other cultures. Vega-Peters noted, as an example of inconsiderateness, that costumes resembling mariachi members are often oversimplified and portrayed in a way that mocks the Mexican pastime and cultural staple. Community Relation Facilitators released a video on Monday on their Facebook page titled, “Think before you costume.” The video took an upbeat approach to the issue, embracing the holiday while remaining informative. Community Relation Facilitator Justin McDaniels hosted the video, pointing out appropriate and inappropriate costumes as a way to supply a distinction for the viewer. Examples of universally acceptable costumes included a gamer, a Beaver fan and a college student. Inappropriate costume ideas included dressing up in stereotypical costumes including a Geisha, an illegal alien, dressing in derivative Native American regalia and wearing blackface. The video included representatives from the Black Cultural Center, Asian and Pacific Cultural Center, Native American Cultural Center and Centro Cultural Cesar Chavez. Each group showed examples of offensive costumes, further explaining how they feel about the costumes and the undertones attached to them. As mentioned in both the video and by those involved, many people see Halloween and costuming without having any limitations, and while they are able to wear what they like, others may feel offended by culturally insensitive costumes. The campaign will feature an event today, sponsored by the Asian Pacific Cultural Center and Community Relation Facilitators titled, “My Culture is NOT a costume.” Alongside educational segments, the event will include festive traditions including caramel apples and mask decorating. Read the full article by reporter Jack Lammers. 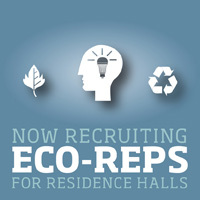 Campus Recycling, the OSU Sustainability Office, University Housing and Dining Services and the Student Sustainability Initiative are recruiting resident students to serve as paid Eco-Representatives (Eco-reps) in three residence halls this academic year (applicants from all halls are welcome). Eco-reps will work to educate their peers about sustainable lifestyles and resources, assist with marketing and outreach efforts for sustainability programs and plan and execute sustainability-focused events. Successful candidates must have excellent communication skills and thrive with minimal supervision, working 5-6 hours/week. Starting pay is $8.80/hour; applications due Sep. 30. To apply, see the full position description. Successful candidates must have excellent communication skills and thrive with minimal supervision, working 5-6 hours/week. Starting pay is $8.80/hour; applications due Sep.30. To apply, see the full position description. A reminder that smoking is no longer permitted anywhere on the Oregon State University Corvallis campus and select OSU property within Benton County signed as nonsmoking. Smoking is permissible on sidewalks that border OSU’s boundaries. Smoking receptacles are being installed in strategic, high-traffic areas around the periphery of the Corvallis campus for disposal of smoking-related litter. Their locations will be updated soon on the policy’s website at http://oregonstate.edu/smokefree. The smoke-free policy is in effect year-round, including game days, so visitors to campus who are participating in tailgating activities will also be prohibited from smoking. Enforcement will focus on educating students, staff and visitors about the policy, but those who refuse to abide by the campus’ smoke-free policy may be cited by OSU Department of Public Safety. Students will be held accountable under the student conduct code and employees under OSU employment policies. Contractors, vendors, event attendees, those who rent or lease university property and other visitors to OSU could be subject to exclusion from campus for violation of the new policy. In a move to promote health and well being on campus, university staff members have been working for more than two years preparing to implement the smoke-free policy on campus, including a university-wide education and outreach campaign, as well as a community forum held earlier this month. University Housing & Dining Services is seeking students enthusiastic about helping others to work with our customer service team. Please apply by July 15 for consideration. Customer Service Representatives provide a wide range of support and services to students, staff, and parents through the UHDS Service Centers via telephone, email, and face-to-face interactions. As a first stop for student housing and dining questions, the service center strives to be a “one-stop shop” for on-campus residents. The service centers manage resident keys, mail, check-in, check-out, work order processing, and general customer service. As a member of the Service Center Complex, Customer Service Representatives are expected to accomplish the primary objectives of UHDS to help create and maintain an effective living/learning community within the complex. A personal and professional commitment to providing excellent customer service and creating inclusive environments is a core value of University Housing and Dining Services. The Operations/Facilities unit of University Housing & Dining Services employs over 50 professional and student staff. We provide residential services for students including room assignments, resident contract management, service center operations, customer service, Residential Conferences, Building Services, and manage Orchard Court family housing. The majority of student staff positions are located at the Service Centers – Arnold, McNary, Weatherford, and West – and the UHDS central office. Some positions exist at the Facilities Maintenance Center and within the Building Services program which services the residence halls during the academic year and the Residential Conferences operation during the summer. With over 150 full time employees and over 550 student employees, UHDS manages the Operations/Facilities, Dining, Marketing, Business Services, and Residential Education program serving over 3,000 resident students and managing 1.5 million square feet of space.